Cemetery records are available at The Old Library in Warrenheip Street, Buninyong. The Old Library is open from 10.00 am to 3.00 pm on most days. 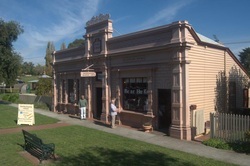 Other information on early settlers of the district may be obtained from the Buninyong and District Historical Society located in the Old Court House in the Buninyong Town Hall complex. Open third Saturday of each month between 9.30 am and 12.30 pm or by appointment.